Grab your favorite drink and enjoy simple relaxing shade in a matter of minutes with the Outsunny 10' x 10' Easy Pop-Up Canopy. 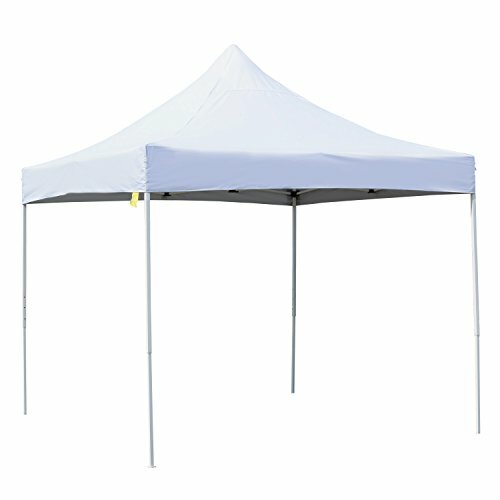 This canopy party tent is perfect for both residential and commercial events including family gatherings, picnics, camping, and even catered events or market booths. This easy pop-up canopy provides a great place to unwind away from the sun's harmful UV rays. With the quick and easy setup and takedown process and a few friends, your tent will be ready to go in a matter of minutes, without the need for any tools. Convenient carrying bag included with purchase for easy transport and storage. ; NOTE: This tent is meant for sun shade purposes only and should NEVER be left up in windy, rainy, or snowy conditions. Please collapse your tent when the weather is windy. We do not recommend leaving your tent erect overnight or for multiple days. We are not responsible for damage due to adverse weather conditions. ✔ VERSATILE USAGE: Our canopy party tent with straight leg design and cathedral style roof offers an open-air feel for a variety of outdoor activities. Great for Weddings, company events, outdoor parties and more! ✔ ROOM TO SPARE: With this easy pop-up canopy, you will have room to spare. The perfect temporary event shelter for weddings, picnics, flea markets, or other large outdoor events and can provide cover for up to 50 people at once. ✔ PROPER SUN PROTECTION: The canopy cover top is built from a durable oxford fabric that has been designed to block up to 99% of harmful, cancer-causing UV rays. Provide your guests with protection and relief from the sun's harmful UV rays with this gazebo canopy cover from Outsunny. ✔ EASY TO TRANSPORT: With this easy pop-up canopy you'll save time and energy with a quick and easy setup and takedown process. Its lightweight frame and included carrying bag makes it easy and convenient to transport from one location to the next. ✔ DURABLE STEEL FRAME: The frame of this canopy party tent is constructed using a sturdy steel material and features adjustable legs and a powder coated finish ensures stability and rust resistance for lasting durability and performance.